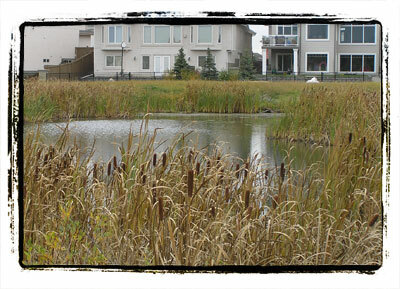 This unique site has been identified as the best example of a permanent wetland in southeast Edmonton and provides critical nesting and breeding habitat for waterfowl. The wetland is less than half a kilometre from Whitemud Creek to the east and a naturalized stormwater management facility and utility corridor to the west, and likely provides an important linking function for wildlife. It has a border of sedge, willow and cattails that serves as an ecological buffer, protecting water quality and providing nesting and feeding habitat for waterfowl. 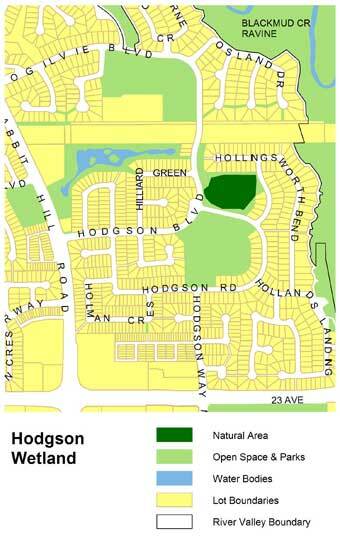 Hodgson Wetland is bordered on its southern side by Hodgson Rd. and on its western side by Hodgson Boulevard. An improved trail runs along the eastern and southern edges of the site, and can be accessed by Hodgson Rd. or by Hollingsworth Green, to the east. There is street parking available on Hodgson Rd. and Hollingsworth Green. There is a viewing platform located at the south end of the wetland, providing an opportunity to view open water, emergent vegetation zones and upland shub areas. A second viewing platform with paved access can be found at the southwest corner of the wetland, providing an overall view of the natural area. Keep an eye out for shorebirds such as killdeer, mallards and common snipe, as well as red-winged blackbirds, black-capped chickadee, house wren, least flycatcher, yellow warbler, savannah and song sparrow, American robins, sandpipers and hawks. The wetland also supports various amphibians.